After months of hints, predictions, and speculation, Egypt’s pound was floated on the market Thursday. Trading that morning at around 8.88 Egyptian pounds (LE) to the dollar, Egypt’s Commercial International Bank (CIB) closed the day at 16. Upon announcing the float, the Egyptian Central Bank set a target price ranging around LE 13 to the dollar, plus or minus 10, and though the rates at banks closed well outside this range on Thursday, the pound will continue to fluctuate as speculation lingers approaching the disbursal of a promised $12 billion loan from the International Monetary Fund. The float follows a turbulent week for the pound; reports since Monday described trades anywhere from over 18 to as low as 11.5 pounds per dollar. This panic marked the pinnacle of months of uncertainty about the fate of the Egyptian pound. In July, Central Bank governor Tarek Amer declared that the defense of the pound on the market was a mistake that had led Egypt to a critical reduction of its foreign reserves and corollary economic woes; his comments suggested to many that at least a significant devaluation would be imminent. That it took another four months to pull the trigger on the inevitable devaluation only further exacerbated the detriment of the already unsound policy. Amer’s ill-timed comments underscore the Egyptian government’s (and particularly the Central Bank’s) tendency to poorly articulate and execute sensible economic policies. Years of mismanagement, particularly since 2014, have brought Egypt’s economy to its knees. Depleted reserves, insufficient GDP growth, high and climbing inflation, and a ballooning national debt have made brutal reforms effectively the only solution: if you’re going through hell, keep going. Devaluation is a bold first step on this path, but the temperature will inevitably rise as the next step brings a slashing of fuel subsidies that will only increase inflation. The government announced a severe 40 percent increase in fuel prices to mirror the pound’s devaluation, to take effect at midnight Thursday, with more price hikes projected for the future as the government attempts to curtail its bloated subsidy budget by 14 percent. In a panic anticipating the overnight price hikes, Egyptians rushed to the gas pumps to squeeze out a last few drops of less expensive fuel. Meanwhile, some contradictions in messaging persist. The government’s declarations, notably those sent by its embassies to international interlocutors, were inexplicably upbeat, touting that the reform’s purpose was to “improve our competitive position.” In a press briefing with Bloomberg, Amer reportedly thanked Egyptians for persevering through the difficult times that passed. Earlier, a Central Bank communiqué was more somber and realistic, a tone welcomed by observers and investors. While fluctuations will continue until the demand for dollars is met (and this is largely contingent on the disbursal of the IMF loan), the government’s target of LE13 to the dollar is likely to be near the stable medium-term price. However, this target may not be reached immediately. Even with the promise of a loan disbursement, past experience has displayed overshooting—and the panic engendered by reports of a price of LE18 per dollar will not soon be erased from memory. Thus, it is likely that the currency will continue an overall depreciation before stabilizing, and it remains to be seen whether the government will be forced to intervene, despite the commitment to a “free” float, in order to cool the market. Already upon Thursday’s announcement, the central bank increased the interest rate by three percentage points to absorb the excess pound liquidity. The government is also expected to begin relaxing currency controls and allowing relatively freer transfers. When it does, it will have to signal its commitment to this policy, and not revert to currency controls if the demand on the dollar exceeds its expectations. As inconsistent measures and conflicting messaging have had negative repercussions for confidence in Egypt’s financial institutions, hedging bets on capital controls would be highly damaging, signaling that a lack of faith in the government’s own target price. Without a doubt, inflation remains the most concerning repercussion of the floating pound, and Egyptians will increasingly feel its pinch. In the absence of any kind of consumer protection recourse in the country, vendors and traders will be hiking the prices of just about everything; Egyptians are already prepared for their objections on increased prices to be met with a shrug and offhand “It’s because of the dollar.” Though many goods have been imported at the parallel market price for the past few months (and at times even higher, as many vendors built in price increases given their uncertainty about dollar availability and exchange rates), key government-supplied goods have not. Egypt is the world’s largest wheat importer, and a net importer of petroleum products. Just last month, Saudi Arabia halted its monthly shipment of 500 million tons of petroleum products. The Egyptian government has scrambled to fill the gap, including an import deal with Azerbaijan’s State Oil Company (SOCAR) and a memorandum of understanding signed earlier this month to begin importing oil from Iraq. But, the bill is getting heavier. And though depreciation will lead to a contraction of imports and an increase in exports, Egypt’s main sources of foreign currency—tourism and Suez Canal proceeds—depend primarily on extrinsic factors: security, international reputation, and global trends in trade and oil prices. Exacerbating inflation, the removal of fuel subsidies is the last reform ostensibly remaining to secure the IMF loan that has been pending since early August. In the words of one expert speaking on the sidelines of the IMF’s annual meetings in Washington, “Egypt cannot afford to stop and halt reforms. The Egyptians are fully aware of the difficulty of the situation, and their [foreign currency] reserves are too low.” As Egypt continues the painful slashing of subsidies, the price of goods will increase almost across the board. The IMF advised against lifting food subsidies to weather the effect of fuel subsidy reduction (at least in the short term), and the Egyptian army has already begun to distribute food throughout the country. 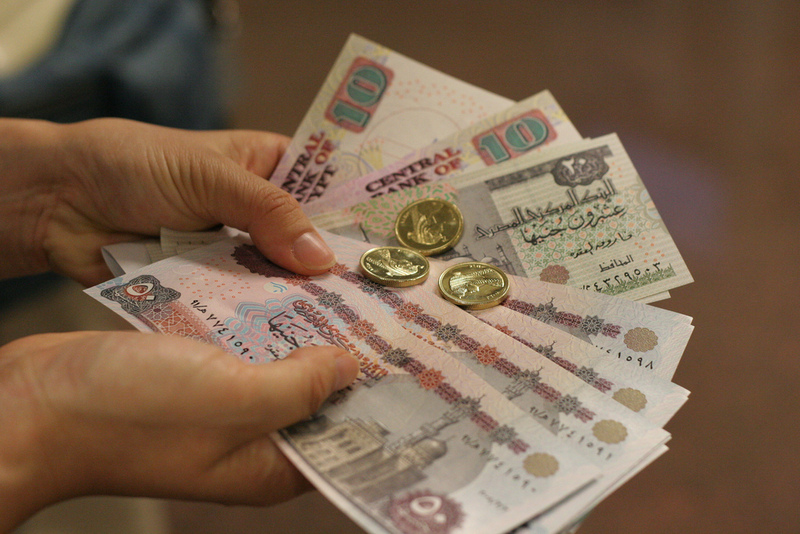 Many Egyptians will suffer from this inflation, particularly those that are already the most vulnerable. Egypt has faced increasing rates of poverty (which has been consistently high over the past decades, even during moments of accelerated GDP growth)—currently over 27 percent of Egypt’s population, or more than 22 million people, survive on less than LE500 per month. The government’s social safety programs, Takaful and Karama, aimed at the poorest and most vulnerable, target 1.5 million families. And even these programs are not fully effective given the difficulty of social targeting in a country where many have no national ID and where petty corruption and favoritism are rampant. Thus, the country’s most vulnerable will be left in the metaphorical and literal cold, as they are largely alone to face the rising costs of food and fuel, already a greater burden on meager incomes. Beyond these most precarious, many families will find it even more difficult to make ends meet, as we could expect inflation to reach up to 30 percent by the beginning of next year. For its part the government will soldier on, with few tools left in its economic policy bag. The challenge now is twofold: marching steadily on the path through hell and mitigating the negative effects on the population. The government must follow through on the expensive game it has begun, as not only is the health of its economy at stake but—equally important—a bruised reputation vis-a-vis its private and public economic partners. It must also manage inflation and effectively communicate policies and implications to mitigate discontent. Given brewing noises of protest and frustration, this may indeed prove more challenging than anyone has foreseen.